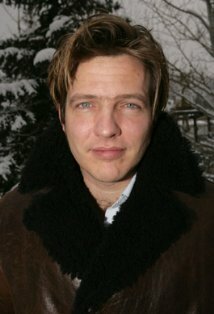 Thomas Vinterberg is a supremely gifted storyteller. His 1998 Dogma film Festen remains, for me, a perfect movie, and that film’s screenplay is, I believe, up there amongst the bet ever written. 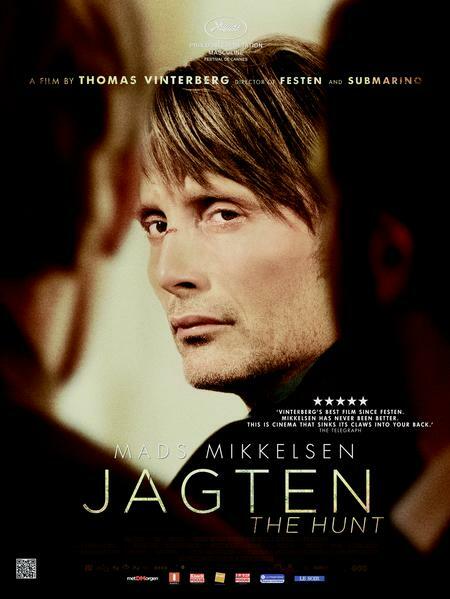 His new film Jagten (The Hunt) is more measuredly paced than that frenetic masterpiece, but it is no less gripping. And at the end of the day it is perhaps even more gut-wrenching. It helps when one of the world’s best actors is your lead. 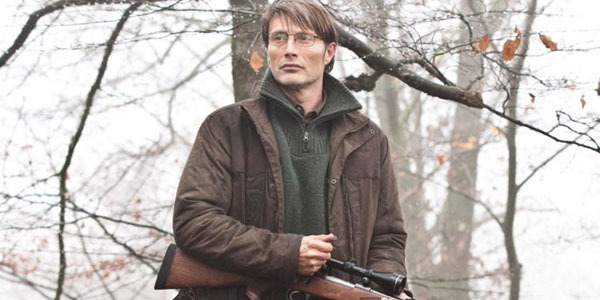 Mads Mikkelsen plays Lucas, a divorced kindergarten teacher in a small town in Denmark, who is falsely accused of inappropriate behavior by a girl in his charge, Klara. As the population turns against him, his life unravels. It’s like the Twilight Zone episode where nuclear panic turns a town into a mob, except here it’s told with realism and a seriously honed eye for the behavior of modern adults (Vinterberg wrote the original screenplay with Tobias Lindholm). It is never remotely suggested (or intended) that Lucas is guilty, which is the right choice: the movie is not concerned with “did he or didn’t he?” (and if the inevitable Hollywood remake is, I’m going to rip it apart). This frees Mikkelsen from having to play that false mystery; knowing he’s innocent, he plays it as an innocent man would – the huge caveat being that even innocent men, when faced with inconceivable and life-altering unfairness – can behave in ways that don’t necessarily help their own cause. While no longer adhering to Dogma’s strict rules of engagement, Vinterberg is still an austere filmmaker: there’s no score for this film – no music at all, as far as I recall – and he has a knack for making gorgeous locations feel cold and threatening. But he utilizes, in a profound and novel way, the zoom lens, to underline significant moments that, in lesser hands, may have seemed verbose; here, it is revelatory. Part of the movie’s intense modes of engagement rest with its absolute accessibility: few films in my recent memory have prompted me to ask myself the classic “What would I do?” The falsely accused man of limited means is weirdly bound by his stuff: his home, his family (here represented by his son), his dog, his surroundings that make up his life. I thought, quite early, “Well, I’d just run.” But where? And how? And, most importantly, how would that look? To call The Hunt gripping would be like calling Annie Hall funny. It is, but it’s also so much more than that. In some ways it’s a horror movie, but the horror is simply a real-life mistake, told realistically, and played out as it might actually play out, with literally terrifying results. I was shattered by this superb, impeccably crafted, brilliantly acted, and emotionally devastating film.